Once upon a time, in a far away Arabian land, there was a man called, Usama. He was widely known of his nobility and courage. His sword and his horse were his only best friends. Growing alone, he has been brought up by the local black smith, who taught him the arts of battle and showed him where dignity lies. Ever since Usama was a young boy, he had his eyes on Laila; she was the most beautiful princess anyone has ever seen. He knew he was not a man of wealth, nor he had the treasures for such royalty. However, he was determined to win her heart at any cost or under any circumstances, that life would ever bring him. One day, the village messengers have crossed the entire village with one rewinding announcement, "Behold the King's most precious proposal, fellow citizens. If a man wishes to marry Princess Laila, he must pass this test. Whoever finds the lost necklace of the Princess will be announced as her Husband-to-be in a grand wedding ceremony, held under their honors.” The necklace belonged to Laila’s deceased mom. She received it as a gift, right after she turned 18. Meanwhile, Usama was working in the workshop when he heard the message. He knew that this was his only chance to win. He looked everywhere; he spent days and nights searching for the necklace with no luck. One night, a young man visited Usama, and he was surprised of how he seemed to know him so well. The man asked for a custom-made sword with rhinestones and diamonds, requesting the name of Princess Laila to be carved on its hand. Somehow, Usama managed to get engaged, gathering the materials for the acquaintance. Usama kept repeating his prayers as he started to get ready for opening the workshop for a new day. And, just when he was headed for the keys, he found Laila’s necklace just lying there. He couldn’t believe himself at first, but suddenly he remembered that it was the same day of the wedding ceremony. 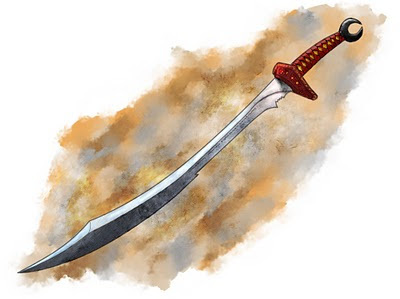 He did not care how it was placed on his shelf for the time being; he just grabbed the sword, carved with her name, and ran to the courtyard of the King’s palace. Thanking God on his way, Usama could not help but think of the old man who came to him the other day. By that time, the ceremony has begun. The King has called for the man who has found the necklace to declare his presence. Then, Usama stepped forward, presented the necklace, and so the lost treasure was retrieved. Princess Laila stood up to greet Usama with a loving smile on her face, while the King took both their hands and blessed their commitment. Usama slowly handed the sword to Laila as a token of affection, and as soon as she saw it, he recognized that she was the one who came for the sword. He could not be happier of not only his bride, but also of knowing that she had feelings for him all this entire time. Life’s gifts are like this ‘necklace’ .. They’re least expected when you’re living a hardship, yet miraculously presented when you are in desperate need. Try not to give up on finding love; just look around you and appreciate what you already have. Be grateful for what you’ve been given and make sure you cherish the ones who love you as long as they do.